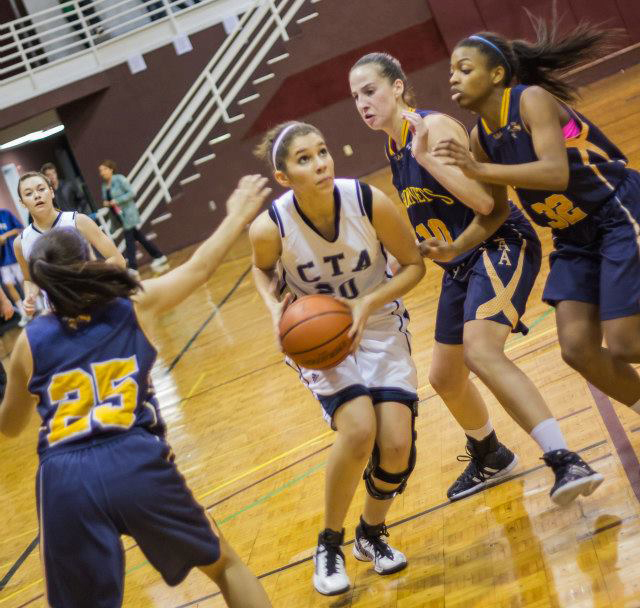 CTA’s Jennifer Ramirez is surrounded by Spencerville Adventist Academy Hornets during play in 2015. January 25-28 marks the 22nd anniversary of Hoops Classic that is hosted at Southwestern Adventist University every year. This year, 48 teams from ten different states will be joining the SWAU family for a couple of days. Originally started in 1996 by Brent Baldwin, the athletic director at the time who also worked with enrollment, Hoops Classic has successfully drawn thousands of kids to the Southwestern campus. According to James The, vice president for student services, the purpose of this event is to give high schoolers an opportunity to visit our campus who otherwise couldn’t come, and enable them to participate in an athletic event. In the past, the use of Hoops Classic as a recruiting tool has worked well as students have been drawn to Southwestern because of it, especially from the East Coast. Hoops Classic allows high schoolers nationwide to get together and play in a friendly, yet competitive game of basketball. Game wise, there has been a couple of teams that have had three-peats but out of the 21 years that this event has been going on, “Florida’s Forest Lake Academy, men’s division, probably has had the most wins,” The states. This highly popular event will allow students from Texas, Oklahoma, Arkansas, New Mexico, Alabama, Florida, Georgia, Maryland, Tennessee, and Arizona to gather together and enjoy a stimulating game and meet the students of SWAU. “We want the teams to get an opportunity to meet our students, get a feel for who we are and to see themselves as part of our campus family,” Almeida says. To give these students a deeper feel for the college life as a Southwestern student, other events such as vespers, church service, tours, and meals are provided for them. The students will either stay in the dorms, gymnasium or in hotels while they are here. Hoops Classic information is provided at: http://studentservices.swau.edu/hoops-classic. The SWAU gym games will be streamed live as well. What’s the Point of Dead Week? What is 4 + 8 ?